Interestingly, they can also tell us useful things about automation, such as whether it poses dangers to us and whether robots will ever replace human workers entirely. In these films, we see the good, bad and ugly of robots – and can thus glean clues about what our technological future might look like. 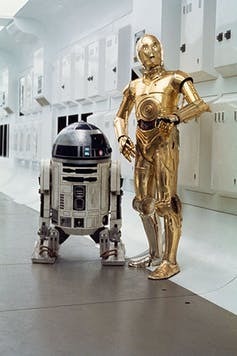 R2-D2 and C3PO in A New Hope. In the most recent movie, Rogue One, an offshoot of the main franchise, we were introduced to K2-SO, a wisecracking advanced autonomous military robot who was caught and reprogrammed to switch allegiance to the rebels. K2-SO mainly acts as a co-pilot, for example when flying a U-Wing with the pilot Cassian Andor to the planet of Eadu.So for instance, C-3PO is a protocol droid who was designed to assist in translation, customs and etiquette. R2-D2 and the franchise’s new darling, BB-8, are both “astromech droids” designed to assist in starship maintenance. 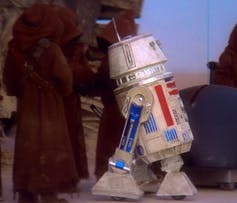 R5-D4, the malfunctioning droid of A New Hope. Perhaps the message from the Star Wars films is that we need to lower our expectations of robot capabilities, in the short term at least. Cars will still crash, mistakes will still be made, regardless of whether humans or robots are doing the work.